In 1998, Canadian Friends of Ukraine initiated a project with the National Parliamentary Library of Ukraine (www.nplu.org) in Kyiv in cooperation with the Parliament of Ukraine (Verkhovna Rada) and in partnership with the Canadian International Development Agency. The project focused on the need to strengthen the process by which legislation is developed in Ukraine by improving access to information for parliamentarians, their staff, and the general public. 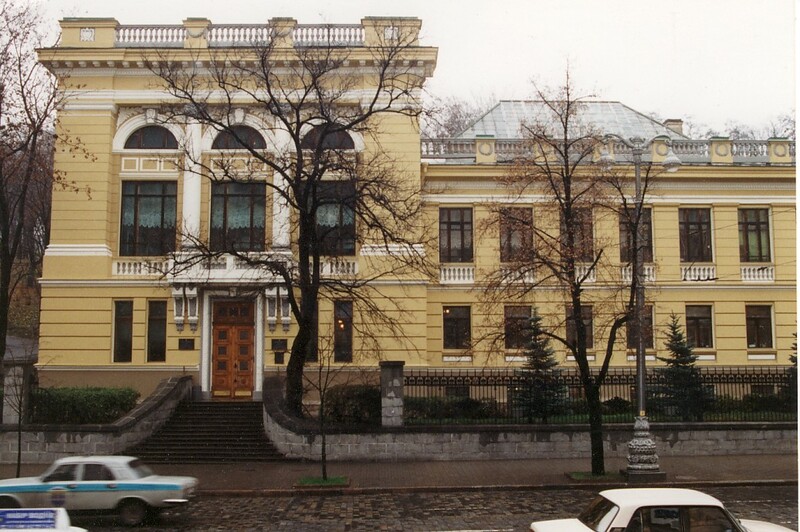 In November of 2000, the project established the Canada-Ukraine Parliamentary Resource Centre on the site of the National Parliamentary Library in Kyiv. Canadian Ambassador Derek Fraser and former Ukrainian President Leonid Kravchuk, we among the many dignitaries attending the opening. Staff and users have access to eight computer workstations, enabling clients to use CD-ROM's, search the electronic catalogue, and conduct Internet searches. Thanks to our assistance in the provision of software and training, users can also scan the Ukrainian index of socio-political articles which contains over 8,000 bibliographic entries. Ukrainian users can now run Cyrillic searches of Ukrainian periodicals on current affairs as they relate to politics and parliamentarians. To access the Canada-Ukraine Parliamentary Centre's unique Ukrainian search engine, click here. The Parliamentary Library produces a "Weekly Survey of Articles", a printed compilation containing an index and clippings of national and international "hot news" spanning 80 national periodicals. The Resource Centre delivers these packets to all 23 parliamentary standing committees every week while Parliament is in session. The Centre's primary users are Members of Parliament, their staff, parliamentary standing committees, and Ukrainian government ministry staff. The Centre's other users include researchers, academics, and university students. Prior to opening the Centre, Canadian Friends of Ukraine hosted librarian internships at Canadian parliamentary libraries in Ottawa and Toronto and provided Canadian experts to train the Centre's Ukrainian staff in Kyiv. Ambassadors of several countries, including Austria, Poland, Italy, France, the USA, and Japan, have personally visited the Resource Centre to familiarize themselves with its unique collection and services. Since its opening, the Centre has welcomed a number of prominent guests and parliamentarians, including Ukraine's President Viktor Yushchenko, Borys Tarasyuk (Minister of Foreign Affairs), Leonid Kravchuk (former President of Ukraine), Oleksandr Moroz (Speaker of Parliament), and countless Members of Parliament. Thanks to the ongoing support of Canadian donors, the Canada-Ukraine Parliamentary Resource Centre conducts training programs for information specialists and its librarians participate in international conferences that focus on the library's unique facilities and services. In addition to providing information and research services, the Centre is also the venue for knowledge-exchange activities and bilateral forums between Canada and Ukraine. The Canada-Ukraine Parliamentary Resource Centre plays a vital role in supporting the ongoing transformations taking place in Ukraine aimed at bringing measurable, systemic reforms to Ukraine's parliamentary and government institutions. July 2007: The Hon. Peter MacKay, then Canada's Minister of Foreign Affairs, during his official visit to the Canada-Ukraine Parliamentary Resource Centre in Kyiv hosted by Canadian Friends of Ukraine and the National Parliamentary Library of Ukraine. Also in attendance were the Ambassadors of Canada and Ukraine, as well Ukrainian government officials and leading Members of Parliament. Ambassador Abina Dann (far right) is greeted at the National Parliamentary Library of Ukraine by CFU Program Director Lisa Shymko, Olena Pogrebna (NPLU Manager), CFU Vice-President Margareta Shpir, and Tamara Veligzhanina (NPLU Director General). At the Official Opening of the Canada-Ukraine Parliamentary Resource Centre in Kyiv, Ukraine in November 2000: (left to right) Borys Kozhyn (Vice Admiral of the Ukrainian Black Sea Fleet), the Hon. Leonid Kravchuk (Ukraine's First President), Ihor Ostash (then Chair of the Foreign Relations Committee), Derek Fraser (Canada's Ambassador to Ukraine) and other government officials. The National Parliamentary Library of Ukraine in Kyiv -- site of the Canada-Ukraine Parliamentary Resource Centre established by Canadian Friends of Ukraine. Parliamentary Open House at the Canada-Ukraine Parliamentary Resource Centre in Kyiv, hosted by Canadian Friends of Ukraine with special guest, His Excellency Andrew Robinson, the then Canadian Ambassador to Ukraine. From left to right: National Deputy Viktor Myronenko (CPU), Gennadi Oudovenko (Ukraine's Former Ambassador to the UN), Canadian parliamentarian Yuri Shymko, Resource Centre Manager Olena Pogrebna, Oleksandr Moroz (Leader of the Socialist Party, currently Speaker of Ukraine's Parliament), Ambassador Andrew Robinson, Ukrainian parliamentarian Levko Lukianenko (Ukraine's former Ambassador to Canada), Oleh Bilorus (Ukraine's former Ambassador to the USA), Hryhori Omelchenko (Ukrainian Member of Parliament, Tymoshenko Bloc), Lisa Shymko (Chair, Canada-Ukraine Parliamentary Centre), Margareta Shpir (Canadian Friends of Ukraine, Vice-President), Vitali Shybko (current Chair of the Foreign Relations Committee of Ukraine's Parliament), Les Tanyuk (MP, Our Ukraine Bloc), Ihor Ostash (Ukraine's current Ambassador to Canada), Anatoli Kornienko (the then Director General of the National Parliamentary Library of Ukraine), Mykola Mischenko (Deputy Chair, Interparliamentary Relations Department of the Secretariat of Ukraine's Parliament).